Create a whimsical garden display with our LuxCraft Garden Wishing Well with Cedar Roof-Small. This little beauty provides an extra something special for your yard or entryway with its charming roof and decorative well complete with bucket. Children are sure to gather around this lovely Amish wishing well to whisper their wishes and play together. Provide a unique centerpiece for your flower garden or a stand out addition for your entryway. This LuxCraft Garden Wishing Well makes a wonderful housewarming or wedding gift. Be sure to review our entire line of Amish Outdoor Garden Decor and have some fun selecting structures to enhance your valuable time spent outside. 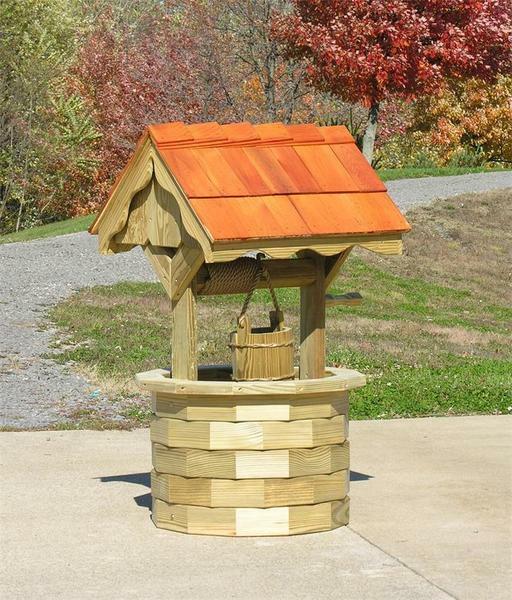 Bring a little country to the outdoors with this lovely Amish wishing well. Handcrafted in Ohio, it is made of pressure treated, kiln dried yellow pine.